Armed men transporting bundles of marijuana in unmarked vans might seem like an illegal activity, but in states such as Colorado and Oregon it’s a legitimate business. There’s a growing need to transport cannabis from farms to dispensaries, and with Department of Transportation-regulated trucks and drivers legally barred from carrying the product, new transportation companies are stepping in to meet market needs. Legal cannabis sales are growing at an annual rate of 17 percent and are expected to reach $13.3 billion in 2020, according to a report by New Frontier Data. Recreational marijuana is now legal in seven states and the District of Columbia, and medical marijuana is legal in 29 states. California’s Proposition 64 – the “Control, Regulate and Tax Adult Use of Marijuana Act” – will go into effect in 2018 and make the state the largest legal marijuana market in the world. Yet transporting the crop presents challenges, including the fact that it can’t cross state lines. Already, a number of companies are offering specialized transportation services for cannabis growers and retailers in some of the states that are pioneering the industry. Because the sector operates primarily in cash and has a small, valuable and untraceable product, security is a top concern, said Noah Stokes, president and chief executive of CannaGuard Security, which is based in Portland and also services clients in Washington, Illinois and Florida. “Pound for pound, it’s like transporting gold. And there are no serial numbers on it. Customers have to pay in cash, and it’s all difficult to insure,” Stokes said. CannaGuard started operations three years ago and now has a highly secured 40,000-square-foot warehouse, a fleet of armored vehicles and 140 employees, many of whom are military veterans. Although a state such as Oregon may produce “several hundred thousand pounds” in a harvest season, most of the loads CannaGuard transports are in small portions, ranging from 10 pounds up to several hundred, to reduce liability and keep the vans small, Stokes said. “We’re not loading up semi-trucks with product and driving them anywhere. It’s small quantities in box trucks and vans going up and down I-5,” Stokes said. CannaGuard transports packaged cannabis and “edibles”– cookies and candies made with cannabis – between farms and dispensaries. And like most marijuana transporters, CannaGuard also hauls large amounts of cash. Because FDIC-insured banks cannot accept money from the cannabis business, those in the industry must store their cash in vaults or transport it to specialized banks. Large cargo vans, such as the Mercedes-Benz Sprinter and the Ram ProMaster, are the truck of choice for most cannabis transport companies. CannaGuard outfits its vehicles with extensive tracking equipment that constantly notifies its command center about truck locations and any deviations from the route or erratic changes in speed. 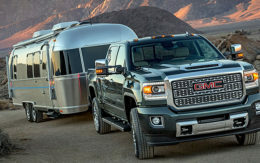 CannaGuard’s vehicles also feature bulletproof glass, armor plating and a series of safe deposit boxes for which each customer receives their own electronic code. CannaGuard vehicles have other defensive measures, including a security fog that can be triggered from inside the cab. “It fills the cabin with this fog or vapor that is so thick you can’t see through it. It also has plant-based DNA so that if the person gets it on their clothing or skin, it takes a month to get out,” he said. Denver-based Canna Security America serves more than 130 clients and 500 facilities in 14 legal marijuana states. Most dispensaries buy in small quantities of 10 pounds or less because of the short shelf life and security requirements, said Tom Siciliano, Canna Security America’s president. Unlike beer trucks that might have consistent routes to bars and restaurants with predictable volume requirements, deliveries to dispensaries can be sporadic and one-off shipments. “It’s not like what you would think from a distribution point. You’re not loading the full truck and just delivering it around town. It’s not quite that sophisticated yet,” Siciliano said. The biggest issue is that marijuana remains illegal under federal law. Like the clients they serve, most of these transport businesses operate entirely in cash and don’t have access to traditional banking for financing. Because the trucks are so small and do not cross state lines, they do not have to operate under DOT regulations. MPS is licensed in seven states, but it still may be operating illegally in the eyes of the federal government, Julian said. The federal government has generally tolerated the growing marijuana industry, yet Attorney General Jeff Sessions recently said that he has “serious concerns” about the effect of legalization. If the federal government were to ramp up enforcement, most in the industry believe it would start with stern warnings to growers. “If they decide to drop the hammer, you could be in trouble, but I would imagine that businesses like mine are pretty safe for now,” Julian said. Many shippers are now keeping an eye on California’s market, which is set to start issuing licenses next year. The California Department of Food and Agriculture regulates cannabis agriculture and estimates that farms produced more than 13 million pounds last year. The amount of marijuana consumed in California is equal to or slightly less than Colorado on a per capita basis, which historically is a heavy producer, according to Terry Garrett, a cannabis analyst based in California. California will need a “large-scale distribution network to move product from farms and distribution centers to dispensaries around the state,” said Hezekiah Allen, executive director of the California Growers Association. Due to the sheer size of the state, growth in the legal weed market will create logistical challenges, and there will be a “significant” demand for small, secured vehicles in the next few years, Allen said. But because big companies can’t participate, and smaller companies don’t have access to financing, it remains to be seen how the market will be served. The demand in California will likely be “too big” for CannaGuard to serve effectively, and the company doesn’t have the millions in capital required to invest in trucks, facilities and labor to scale, Stokes said. “There’s going to be a big demand, and where there’s an opportunity, people will rise to the occasion,” Allen says. Why not use the same vehicles they use for money? Already hardened and secure. If they are good enough for banks they ought to be good for the cannabis industry. The vehicles used for Cannabis Transport have to be climate controlled. They need to control the humidity closely which money trucks don’t do. Biggest misconception in the industry. There is nothing in Cole or FinCEN Marijuana filings regs that say a bank or credit union cannot take cannabis related accounts. The rules are very specific as to how those accounts need to be treated, but that’s the extent of it. Guidance letters from the banking commissions refer to “encouraging” the use of banks for the sector, not refusing to bank the industry. 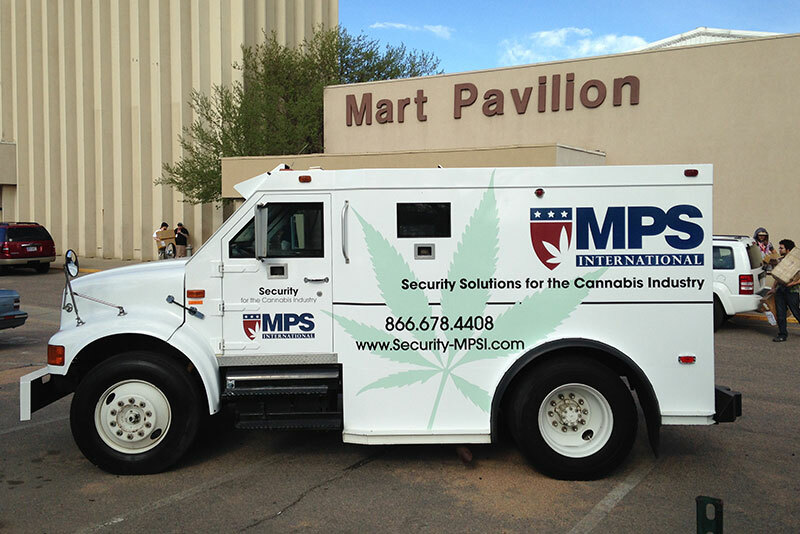 I am kind of curious as to why MPS International does not have flashing strobe lights on top of that armored truck? Makes no sense to me to advertise on the side of a truck that you’re breaking a federal law. They seem to me to be attracting trouble. Who are they advertising to? If you’re in the industry, you’re aware of their services. I totally agree that broadcasting with a mobile billboard is the opposite of a clandestine approach to security. Can’t see a legal purpose, marketing or common sense reason. Blending in, being inconspicuous seems a better strategy. Are we missing something here? Those trucks are solely for shows, not for working on the road. The road vehicles are much more discreet and have NO markings on it.